Closed home sales were down slightly (-2.5%) in August. Constrained inventory has slowed home sales, because some consumers are not finding what they want. Lawrence Yun (the NAR Cheif Economist) has stated that the consumer may get to a point where he/she will not be willing to pay the prices that home sellers are asking with home price inflation (+6) outpacing wage growth (+2.6%). 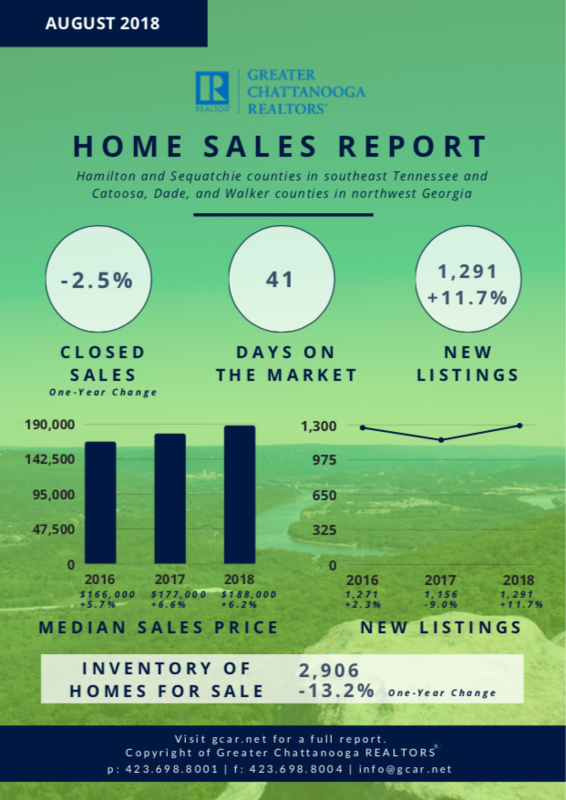 The Great Chattanooga Realtors states, "That kind of gap [between wage growth and home prices] will eventually create fewer sales due to affordability concerns ." The good news for home buyers is that the inventory of homes for sale rose 11.7%. Nice/saleable homes are staying on the market longer than 1 week now, so you have a better shot at getting the home that you want. Home prices rose in August by 6.2%. "While some are starting to look for recessionary signs like fewer sales, dropping prices and even foreclosures, others are taking a more cautious and research-based approached to their predictions. The fact remains that the trends do not yet support a dramatic shift away from what has been experienced over the last several years. Housing starts are performing admirably if not excitingly, prices are still inching upward, supply remains low and consumers are optimistic. The U.S. economy is under scrutiny but certainly not deteriorating" (Greater Chattanooga Realtors).